This is a Nerf gun that I modded and painted. Basically I took some scraps I had laying around, including some of old costume jewelry, buttons, a wall socket and a wooden thimbly thing... and glued them onto the gun. I glued with e6000 glue, but I used the hotglue gun to make a few accent bits around the socket with glue and to fill in a few parts. I sanded off some of the "NERF" insignia (but not all). I also took a knife to the gun and cut gouges into it to give it "battle damage". Then I took gold paint and rubbed it on the gun with my fingers. This brought out the raised areas of the gun and made it look old. I used a metallic aqua acrylic for the accent parts. Then I sealed the gun. The last step was adding the untarnished parts which are clock gears, a piece of dichroic glass and a few more bits of costume jewelry. That looks so awesome! Almost like steampunk. It is so pretty, I love the blue 'popping' out and the adding of more steampunky parts! You surely did a wonderfull job though! I'm working on mine still, Do you have any suggestions since this is my first one? I'm shoving my money into the screen, but for some reason, the modded Maverick gun won't appear in my hands. Heh heh, another quality product from the New England Rifle Foundry! Hello! I wanted to let you know that this was featured in #projecteducate's Artisan Crafts Week as one of the most notable examples of artisan crafts. You can read the article here: [link] and feel free to be a part of the Artisan Crafts week, we have lots of activities and a contest planed! This is awesome. What are you using to seal it? I did this same project, but much less beautifully, and now I need a good sealant for it. That is pretty freaking awesome. holy cow, how awesome is this. you are now my favourite person ever. that's a pretty cute video, and I'm not a super big fan of just putting goggles or gears on something and calling it steampunk, either but I'm just having fun with a gun, no need to get your knickers in a twist. I hope you aren't searching through DA and leaving snippy comments on a bunch of people's "not as clever as you'd like" steampunk entries. Wonderful work! I never would have known it was a nerf gun aha. You did such a fantastic job modifying it from the original. ^_^ fav. epic... i wanna do that with the next nerf gun i get! badass! 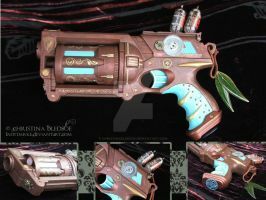 i just bought the same nerf pistol to make steampunk and came accross this photo on google. I won't copy-cat but yours is the best so far of this model!!!!!!!! !